One of the best information literacy conferences I've attended is WILU. Consider submitting a proposal for a presentation, an ignite talk, a poster session, or a pre-conference workshop. 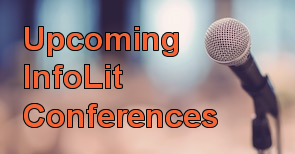 Here is an update to our recently posted conference roundup. The Library Assessment Conference has issued an invitation to submit proposals. This is a great conference. If library assessment is your thing, you will find much to stimulate your thinking here. And if talking about your assessment project or research moves you, this conference delivers a great audience. We’ve been fortunate to work with many great institutions of higher learning across the country since our information literacy assessment went into production. In fact, we even have a few institutions that started with us in 2006 and are still testing with Project SAILS today. One such institution is Polk State College, under the direction of Bill Foege. We had the opportunity to sit down with Bill at ACRL 2013 in Indianapolis to learn more about how he has used our information literacy test at his institution. As Bill shares, Polk utilized the cohort assessment within their nursing program to better understand the information literacy skills of its students. In 2010, Polk began testing graduating students with the individual scores test at both their Winter Haven and Lakeland campuses. Polk State College has utilized both versions of our information literacy assessment in order to collect different types of information – exploring the individual skills of students and determining the skills acquired by graduating students during their two years of study. Learn more about using Project SAILS at your institution today! I recently attended an online open forum on ACRL’s revision of the Information Competency Standards for Higher Education. The presentation / discussion was ably led by Trudi Jacobson and Craig Gibson, who co-chair the revision task force. They concluded with the timeline, which is ambitious and clearly reflects a commitment to hard work. A draft is scheduled to be released December 1! There is a web site for the project. It includes the informative slides plus recordings of two of the forums and a host of other material. Hofer, A., L. Townsend, and K. Brunetti. (2012). “Troublesome concepts and information literacy: Investigating threshold concepts for IL instruction.” portal: Libraries and the Academy 12(4), 387-405. Mackey, T., and T. Jacobson. (forthcoming). Metaliteracy: Redefining Information Literacies to Empower Learners. ALA Editions/Neal-Schuman. During the forum I attended, there were lots of great questions. People wanted to know if there would be mapping from the current standards to the new ones, and how the new standards would relate to the AAC&U VALUE rubrics and to accrediting agency expectations. There were questions about SAILS, too! We are committed to developing new tests that reflect the new standards. We are committed to maintaining our current tests as long as they are of use to our participants. Stay tuned to progress on the new standards, and for developments on the next incarnation of Project SAILS information literacy assessment.